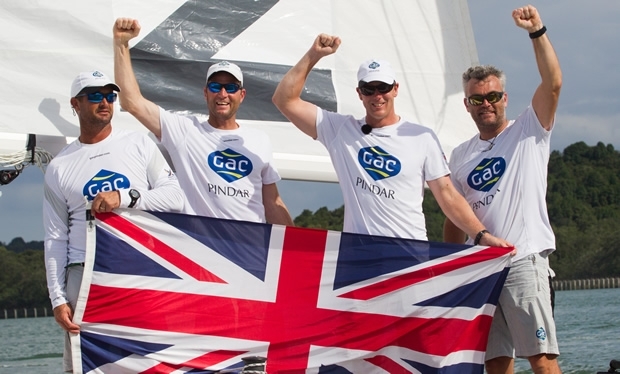 Britain's Ian Williams dominated Taylor Canfield to win the Final of the Monsoon Cup 3-0, sweeping the GAC Pindar skipper to his sixth World Championship title on the World Match Racing Tour. Williams has extended his record as the most successful match racing skipper in the history of the Tour. While Canfield was getting the better of his arch-rival in the pre-starts, once out of the blocks GAC Pindar was just coaxing maximum speed out of the FarEast 28R keelboat on the challenging, ever-changing Straits of Johor. The path to the Final had been very straightforward for both teams, with Williams outsmarting Hansen in all three pre-starts to win 3-0, the same score by which Canfield dispatched Eric Monnin (SUI). At the prize giving ceremony at the Hotel Jen in Puteri Harbour, His Royal Highness Sultan Ibrahim Ibni Almarhum Sultan Iskandar, The Sultan and Sovereign Ruler of The State and Territory of Johor Darul Ta'zim presented the Garrard-designed World Match Racing Tour Championship Trophy to Williams and his crew. Also in attendance was YB En Khairy Jamaluddin Abu Bakar, Malaysian Minister for Youth and Sports, and YB Dato' Zulkurnain Hj Kamisan, Johor Youth, Sports, Culture and Heritage committee chairman. From a total prize purse of US$440,000 for the World Match Racing Tour, Williams’ season victory earns him US$80,000. He also receives 310,000 Malaysian Ringgits (approx US$75,000) for his Monsoon Cup victory. After finishing runner-up at the Monsoon Cup, Canfield finished 2nd overall in the Tour standings with Hansen 3rd for the season. Now the teams have just a month to regroup and ready themselves for a very different challenge in Fremantle, Australia, where we will see 20 teams doing battle in M32 multihulls for the first time, competing on the World Match Racing Tour 2016.